LOS ANGELES, CA--(Marketwire - May 1, 2008) - For decades Hollywood has looked to science for inspiration, now IBM (NYSE: IBM) researchers are looking to Hollywood for new ideas too. The entertainment industry has portrayed possible future worlds through science fiction movies -- many created by USC's famous alumni -- and IBM wants to tap into that creativity. 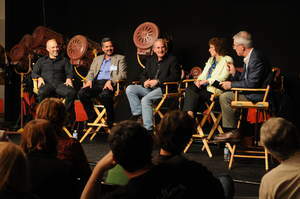 At a kickoff event at the USC School of Cinematic Arts, five of IBM's top scientists met with students and alumni of the school, along with other invitees from the entertainment industry, to "Imagine the World in 2050." The event is the first phase of an expected collaboration between IBM and USC to explore how combining creative vision and insight with science and technology trends might fuel novel solutions to the most pressing problems and opportunities of our time. The event was also aimed at giving filmmakers access to IBM scientists for new ideas about the trajectories of science and technology as they create new films and for IBM to tap into the ideas of Hollywood's current and future creative minds. At the event, IBM researchers discussed the potential for self-healing spinal cords; embedded digital assistants that remember all you hear or say; the concept of "longevity management" for life-spans stretching past the century mark; drinkable, purified water everywhere; changes to the human genome; and many other insights into what the world might be like in the Year 2050 and beyond. While many of these ideas sound like science fiction, IBM scientists say that projects incubating today in IBM labs, and elsewhere, might just make them a reality. "We've long realized that radical innovation can be accelerated by tapping into the most creative talent we can find," said Don Eigler, Fellow, IBM Research. "Working with the USC School of Cinematic Arts is likely to give us a glimpse of the future that we never would have on our own. I expect sparks to fly." IBM has a history of opening the doors of its Research labs to work directly with clients on their toughest problems, and in the past five years has accelerated its approach to innovation by tapping into the collective brainpower of: clients, partners, universities, IBM employees and even their family members. This model has accelerated IBM's ability to collaborate on new ideas and create new market opportunities. Following last night's "brainstorm" event, IBM Research and the USC School of Cinematic Arts intend to collaborate on a unique research project with the goal of exploring a future in 2050 based on scientific projections for areas including nanotechnology, digital imaging, predictive software, and emerging medical, environmental and collective intelligence technologies. The project might inspire new movie or television scripts, digital media projects, a time capsule or lead to novel projects and applications that IBM could pursue. "This research project will give our students and faculty access to another world of ideas via IBM Research. It's an exchange we hope will fuel the imagination on both sides of the collaboration," said Professor Richard Weinberg, Ph.D.
IBM Research is a prolific and far-reaching commercial lab, with five Nobel Prize winners and 15 years of US patent leadership. IBM Research is engaged with many public and private researchers around the world to better understand and address some of the biggest issues of our time. Additionally, IBM has long been engaged with media and entertainment companies, helping them to transform their business operations and produce, store and distribute digital content. IBM's advanced technologies help film studios produce vivid animations and visual effects and make the process of creating movies and television episodes more efficient. With six divisions in animation & digital arts, critical studies, film & television production, interactive media, producing and writing, the USC School of Cinematic Arts covers the entire spectrum of the art form and industry. The school has been heavily involved with technologies such as high-speed networking, digital cinema, performance capture and computer animation. Taught by award-winning faculty, SCA students and alumni are a major force in entertainment arts production, research and scholarship. While IBM and USC discuss the far future of science and technology, in Los Angeles this week, IBM is gathering more than 1,000 business leaders from its top partnerships around the world. The IBM Business Partner Leadership Conference, taking place at the Los Angeles Convention Center, is focusing on nearer-term technology trends that are shaping the world's innovation agenda and creating new growth opportunities for companies and countries around the globe. More information is available at http://www.research.ibm.com/theworldin2050.